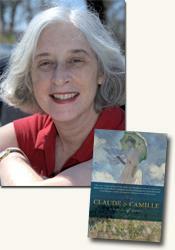 Contributing editor Luan Gaines spoke recently with author Stephanie Cowell about her latest novel, Claude & Camille: A Novel of Monet , the master painter's lifelong search for light, his conflicted and co-dependent relationship with his wife and muse, Camille Doncieux, and the birth of Impressionism. Interviewer Luan Gaines: What was your inspiration for Claude & Camille ? Claude Monet enjoyed a long and prolific life. Why have you chosen to focus on the early years of the couple in Claude & Camille ? I find the formative years of an artist the most interesting. Monet’s early years when he was poor and terribly in love were the years that first informed his lifelong search for light. The vision of the Impressionists falls far from the mainstream accepted by the Paris Salon. How is Impressionism different from the work of other painters? Where does the word “Impressionism”originate? The favored style for the most part before Impressionism was Academic, great paintings of gods and kings, taking many months to create. Impressionist paintings were often created quickly, using loose, rapid brush strokes, blended colors. Critics were horrified at this new style. At the first exhibition of the Impressionists in 1874, one critic called Monet’s famous Impression: Sunrise “a bad design for wallpaper.” The odd thing is one can buy wallpaper of that painting today! But the name stuck: Impressionism. Incidentally, I never felt Edouard Manet’s style to be at all Impressionistic, but he was with them so he is lumped also under that name. You see what a name can do! Who are some of Monet’s contemporaries? Paul Cézanne, Edouard Manet, Camille Pissarro, Auguste Renoir, Alfred Sisley, Edgar Degas, and also the glorious women painters Berthe Morisot and Mary Cassatt, who largely painted the world of women and children. And of course Monet’s best friend, Bazille, the painter/medical student from Languedoc. When does Claude first meet Camille Doncieux? Given Camille’s position in society, what is her parents’ reaction to Monet? Her sister’s reaction? Would Camille’s family prefer the couple not marry? In my novel they first meet in a bookshop where she is helping her uncle. She is upper-middle class, petite bourgeoisie, and her family and sister are horrified that she is taking up with a penniless painter who doesn’t even have his own place to live, who lives with his friends in a studio. Then he takes her to live above a laundry. From their point of view, of course, they would be worried. When first they meet, Camille is writing to someone - a lover, a fiancé. How does the thought of Camille’s love for another haunt Claude through the years? How do Camille’s emotional needs impact Monet’s work? Claude is very jealous, of course he doesn’t feel good enough for her; he wants to give her everything and he has little to give. He sees her as an ideal, but she is really an insecure girl who half lives in fantasies and sometimes does not know when she is telling the truth. Camille is Monet’s muse, but she also drives him to distraction. How critical is this woman to the evolution of Monet’s work? How would you describe the emotional complexities of their relationship? As I said above, Camille is an ideal for him but she’s really a very human girl, terrified of growing older or losing her beauty. And he is an ideal for her: she wants to give all her life to a gifted artist. She sees her parent’s world as dull. And he can’t make money, and she begins to doubts the wisdom of this relationship, but they are still tied to the ideal of the other and very emotionally dependent. Monet is particularly close to Frédéric Bazille. What qualities attract the two friends to one another? Is Bazille’s work on a par with Claude’s? Frédéric also holds Claude as an ideal, because he sees he is a young genius, the best of all of them. Claude is very definite in what he wants to do and Frédéric is searching for his style, for who is he. He is also emotionally dependent on his parents at home and wants to please them. Frédéric work really isn’t impressionistic. It really varies; it’s hard to say what he would have become. He was a gifted painter but Claude was a genius. The other painters had long lives to develop. There are a few marvelous paintings by him in the Washington National Gallery. The band of brothers - Monet, Cézanne, Edouard Manet, Pisarro, Renoir, etc. - share and share alike in times of hardship and plenty. Who among them is the most generous and how does this attitude enable all of them to continue painting? Frédéric Bazille has more stable family money so he generally paid the rent and the food. The rest had very little of anything; Edouard Manet also had family money, and he bought some of Monet’s paintings when Monet was desperate. Then Monet turned around and fought for Manet’s work after Manet died young. That was the sort of closeness most of them had. Monet had just moved into Giverny and was not really unpacked when he heard the terrible news of Manet’s death and ran into Paris to be a pallbearer. By the way, I have a blogspot called Everyday Lives of the French Impressionists. Monet rejects his father’s business to move to Paris and paint. What is his father’s reaction? Is Claude conflicted by his decision? Claude’s father was not happy because even back then a life in the arts was a life of financial insecurity. Claude was not conflicted at all, but he did want a stable income. Claude Monet is very dependent on his friend Frédéric, who later does something which Claude sees as unforgivable. How would you define Monet’s feelings for the man who both loves and betrays him? I read every book I could find on Frédéric and the Frédéric /Claude friendship, and there are several. They were two young guys who met in art class; Frédéric wanted to be an artist, and his parents wanted him to be a doctor. Claude encourages his talent and believes in them, and Frédéric is always bailing Claude out. It’s a supportive co-dependent relationship which makes them enraged at each other when the relationship cracks. Frédéric as a person is so important to me that early drafts were largely about him! The Impressionists endure very difficult lives in a city that will not accept or acknowledge their work. What did you learn from your research about the hardships of these gifted men and their ability to work in spite of poverty and rejection? I admired them so much! I think most artists have a hard time forging forth and it was thirty years before Claude Monet could make any kind of dependable income. “We stood shoulder to shoulder against the world,” Auguste Renoir said, looking back. Claude never had enough money. Paint was very expensive. He was always being thrown out of his rooms because he could not pay his rent. Once he was thrown out naked in the middle of the night! Then he would go sleep on a friend’s floor. Not all the young painters were poor: Edouard Manet and Edgar Degas had family money. But the poorer ones were always pawning their watches. Renoir painted blinds for a while; he learned how to paint clouds on them very fast. Pissarro painted fans. Renoir was smart enough not to take on a wife until he could afford a family, but Pissarro, Cézanne and Claude Monet were not that wise. Then it was the choice between feeding the baby and buying paint. Monet draws inspiration from light and movement, whether in Normandy or Paris, the French countryside or in portraits of Camille. Who is his first mentor and what does this man teach Claude about sacrifice and art? Claude began by drawing caricatures in his native town of Le Havre and by seventeen he was making a lot of money and didn’t bother to go to school, to his father’s anger. One day he met a quiet, modest man called Boudin who was a landscape painter and who took him painting as a challenge. Claude said, “Oh, this isn’t so hard! I can do this and get back home to bed in a few hours…” He didn’t think much of getting up before dawn and standing outside. But then he became obsessed. Boudin taught him that he must show his heart and that sometimes he would break down and want to throw it all over but then he would go back. Claude in life did break down now and then from the strain of no one wanting his work and his dissatisfaction with capturing light well enough. In one very serious breakdown in my novel, it is only Boudin who coaxes and tricks him into painting again. Claude eventually reaches a point where he is unable to paint, where inspiration fails him. What is his reaction to this condition? How is it resolved? Well I don’t want to go into plot details, but he has times where his art breaks down under constant rejection and tremendous poverty. But he was very strong; he overcame it. And his friends helped him. They stood “shoulder to shoulder,’ to quote the gentle, optimistic Renoir again. At the beginning of his painting career in Paris, Claude is conscripted by the army and later bought out by his great aunt. Later, when the war with Prussia looms, he flees with Camille and their son, Jean, to England. Please explain Claude’s reason for leaving France and the antipathy of the others towards war. Claude was JUST beginning to find some stability and success when the war came and it all broke down. He left for fear of being conscripted again and there was a division of feeling about this among the artists. Manet and Degas volunteered to serve in Paris, Renoir was drafted but spent the short war learning to ride a horse and giving drawing lessons. Cézanne fled the south of France. Pissarro joined Claude in London. Frédéric Bazille chose another course, which turns the plot in Claude & Camille . Claude and Camille separate a few times during their years together. Is there ever a time when Camille actually tires of the artist’s life? At what point is the pair the most vulnerable? Camille has dreamt of loving a great struggling artist when Claude walks into her life. But she came from a well-off family and had no idea of what years of struggle will mean. It wore her down. After a time she suggested he go work for her father in the silk business and Claude was appalled. I think she never imagined what it truly would be like to marry someone to whom painting was as necessary as breathing. He breaks down and goes off by himself at one point. I think it was never easy to be married to Claude, loving as he was. In the novel I cut down the poverty and hardships to just a little of what it was in real life! And the loneliness. I am curious about Monet’s attraction to Alice Hoschedé. If he loves Camille, why is Claude drawn to Alice? Does Alice bear Claude’s son while she is married to her husband? At one point the relationship between Camille and Claude is very strained, and she is emotionally quite unstable. He is thrown together with Alice, whom he sees as the calm he desperately needs. About the son, the readers will have to discover that! Camille’s death is slow and agonizing. How does Claude react? How does her death affect his work? Does Camille remain Monet’s muse even after he marries Alice Hoschedé? Claude kept paintings of Camille all his life, even in his bedroom! And years after her death he painted his stepdaughter in the same posture with an umbrella on a hill as he had painted Camille years before. Talk about haunted! I think Camille haunted him all his life. What is known about the real Camille Doncieux? There’s little known about the real Camille! One scholar (Ruth Butler) has devoted a third of a book to her ( In the Shadow of the Master ) and a full study is to come. When I began to write the book, I contacted one of the major Monet scholars in the country and asked, “What can you tell me about Camille?” And he said, “Almost nothing.” We have no letters, only parts of a friend’s diary and a few of Bazille’s and Claude’s letters which speak of her as happy, weeping, other things. We have the many paintings of her; we know when they married, where she was born, that she was charming, that she loved acting, etc. We know her family disowned her when she went to live with Monet. We know where and when she died, but even the cause of death is disputed. So this is character whose personality is a mystery. I spent many hours studying portraits of her to find out who she was and with the help of my editor Suzanne O’Neill at Crown, the portrait of her in my novel formed. What are the most productive years of Monet’s life artistically? What is he seeking in creating the gardens at Giverny? Even without Camille, does Claude find peace at the end of his life? Monet was very productive all his life, but he shut down when faced with the death of someone very dear to him. Does he find peace? Well, again, dear reader, please read the book and form your own conclusions! He sought many things in Giverny. The gardens are absolutely huge for a man who is not nobility. Giverny became a refuge where he could paint. He hardly painted anything else in his older years. He had flowers and the water reflecting the sky. Other artists have repeated one subject many times: Degas and his ballet girls, Corot with water, trees and light for example. To look at one thing more and more deeply every day and to find all things in it. What did you find most difficult in writing Claude & Camille ? The most rewarding? Stephanie Cowell is the author of Nicholas Cooke: Actor, Soldier, Physician, Priest ; The Physician of London (American Book Award 1996); and The Players: A Novel of the Young Shakespeare . She is the also the author of Marrying Mozart , which was translated into seven languages and has been optioned for a movie. Visit her at www.stephaniecowell.com and everydaylivesfrenchimpressionists.blogspot.com. Contributor Luan Gaines interviewed author Stephanie Cowell, author of Claude & Camille: A Novel of Monet (see accompanying review), about her book for curledup.com. Luan Gaines/2010.